1.Primary study of the basic theory of integrated agricultural production and prot ection. 2.Advances and preferable approaches to honeybee transgenesis. 3.Application of molecular biological techniques in insect phylogeny of the family Tephritidae. 4.Potential threat caused by red imported fire ants to some species in China. 5.The evaluation and sampling techniques for wireworms. 6.The effect of body weight and host plant on cannibalism in cotton bollworm,Hel icoverpa armigera. 7.Occurrence and control of Sphaeroderma apicale. 8.Preliminary study on different larval instars of seabuckthorn carpenter moth, Holcocerus hippophaecolus. 9.Orientation behavior of Bemisia tabaci to locate underside of host leaves. 10.Oviposition selection of Gravitarmata margarotana adult. 11.Resistance of Plutella xylostella to nine insecticides in several field popu lations in China. 12.The effect of sublethal doses of insecticides on the functional response of As ecodes hispinarum. 13.Evaluation of six insecticides susceptibility in Chilocorus rubidus. 14.Bioactivities of extracts from Cnidium monnieri against storedgrain insect s.
15.Insecticidal activities of plant extracts in West of Hubei. 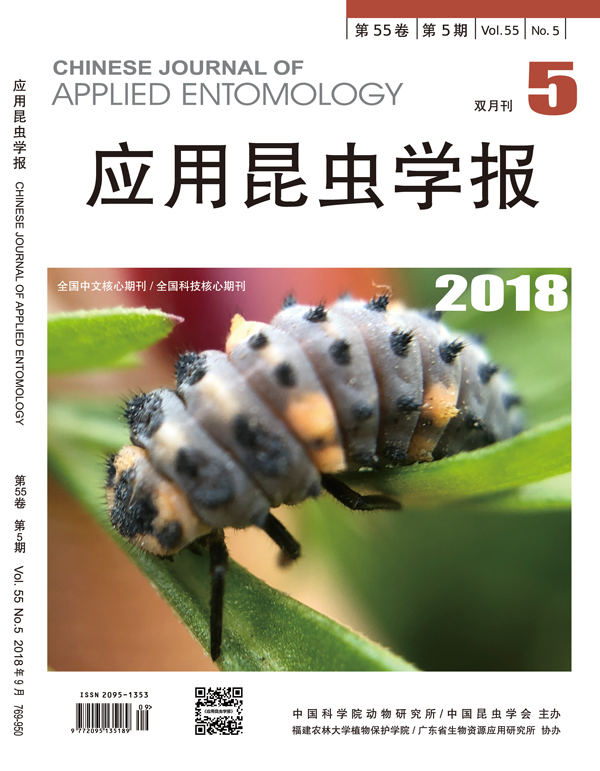 16.Identification and behaviors of parasitoids of Sylepta derog ata in the Yangtze River and Huihe Valley. 17.Effects of temperature on development, fecundity and longevity of Habrobracon hebetor. 18.Parasitizing capacity of several trichogrammatid species on Ocinara varians. 19.The survival rate of Scleroderma sichuanensis in different storage condition s.
20.Flower visiting insects of Amomum villosum and their flower visiting and ne sting behavior. 22.Determination of nutritional components of in Palembus dermestoides . 23.Determination of nutritional components in Chrysomy megacephala. 24.The influence on plants nutrient contents parasitized by Kerria lacca. 25.Faunaistic characteristics and distribution pattern of Sphingidae in Changbai M ountain. 26.Faunal study on syrphids of the north slope of Taibai, Qinling Mountains of Shaa nxi. 27.Outbreak of later brown plant hopper，Nilaparvata lugens, in Wujiang City of 2005 and its control strategies. 28.Control effects of tachinid flies on the omeadow moth, Loxotego stictialis. 29.Spatial distribution of emerald ash borer, Agrilus planipennis. 30.Bionomics of felt scale, Eriococcus costatus and its control. 31.A preliminary report of biology in Dysodia magnifica. 32.Comparisons of different collection methods of histerid beetles and their applic ations in field investigations. 33.Collecting and slide preparation methods of thrips. 34.A modified practical method for rearing Aphis craccivora with meridic liquid nutrients. 35.Rapid quarantine and identification of Bactrocera dorsalis. 47.Luminous beetles and their bioluminescence. 48.Schoenobiinae， a group of important agricultural pests.